Product prices and availability are accurate as of 2019-04-16 20:01:51 UTC and are subject to change. Any price and availability information displayed on http://www.amazon.com/ at the time of purchase will apply to the purchase of this product. 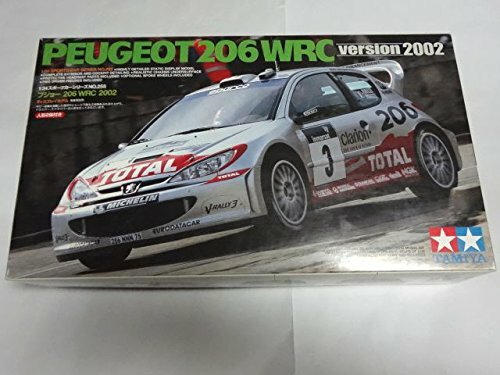 modelcars is proud to list this #24255 Tamiya Peugeot 206 WRC Version 2002 1/24 Plastic Model Kit,Needs Assembly by Tamiya. 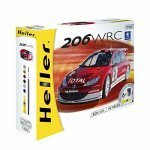 Gift this awesome #24255 Tamiya Peugeot 206 WRC Version 2002 1/24 Plastic Model Kit,Needs Assembly made by Tamiya and carried by ModelCars.us. This interesting model is currently in stock - purchase securely and safely through us today. The Peugeot 206 WRC made its impressive debut at the "Tour de Corse", the 6th race of the 1999 World Rally Championships (WRC). When the 206 made its full WRC entry in 2000, it clenched the Manufacturers' and Drivers' dual title. Holding strong the following year, Peugeot managed to win the Manufactures' title in 2001. Based on these successes, Team Peugeot entered the 2002 season with high hopes. The Peugeot 206 WRC 2002 which features a 4WD mechanism with longitudinally installed transmission combined with a 2-liter turbo engine mounted on the most compact chassis of all WRC cars, underwent improvements regarding cooling system, engine power and weight. The Peugeot's short wheelbase and overhang provided high maneuverability at the cost of instability on poor roads and at high-speeds. To overcome this problem, the car was equipped with electronically controlled active differentials, and in 2002 an active anti-roll bar was newly loaded. This device regulates the roll of the car via electronically controlled hydraulics capable of setting modifications during running. Drivers for the 2002 season are the 2000 World Champion M. Gronholm, 2001 World Champion R. Burns who transferred from Subaru, Tarmac specialist G. Panizzi and gravel specialist H. Rovanpera. Despite bad results at the season opening Monte-Carlo Rally, Peugeot 206 WRC machines placed 1st and 2nd in the 2nd to 5th rally and monopolized the 1st and 3d positions in the 3rd rally, proving their superiority and continuing their tradition os excellence in the 2002 season.